41918-SS is rated 4.8 out of 5 by 11. Rated 5 out of 5 by Chad from 18” grab bar This product is both attractive and functional. It is smooth to the touch and looks great other than the reason for its purchase, added security. We also purchased matching towel bars and the look is fantastic. 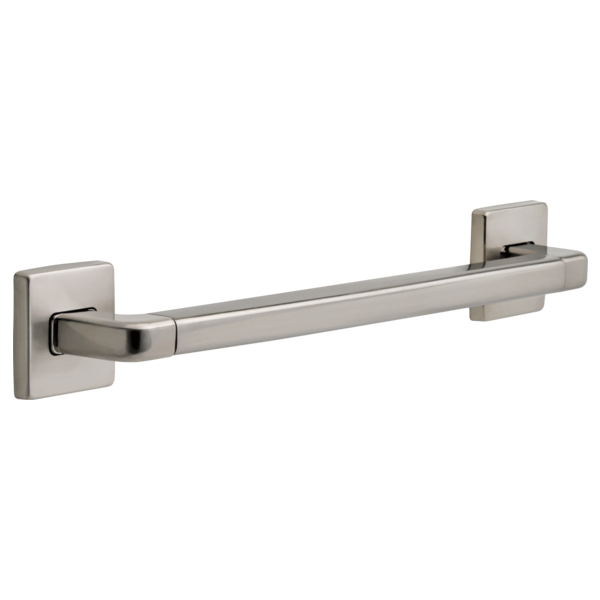 Rated 5 out of 5 by LK from Grab Bar This grab bar is attractive and was easy to install. We remodeled a guest bath and felt the need for a bit of security for our older guests. Rated 5 out of 5 by Marylander from Satisfied Does the job and looks nice in my new shower. Rated 5 out of 5 by Alex from Grab Bar Works well. Gets the job done. Rated 4 out of 5 by pappatim from 24 Inch Grab Bar The 24" Delta Grab bar with concealed mounting is a sturdy grab bar for the tub. It has a nice modern design and feels sturdy on the wall. It has a nice square appearance - not rounded like most grab bars. Rated 5 out of 5 by Miriam from Excellent grab bar I bought Delta products for my master bath remake and loved all the items including the grab bar which turned out awesome. Rated 5 out of 5 by Jeanne B from Stylish and sturdy I was looking for something that had style and still functional. This fit the bill and exceeded my expectations! Thank you Delta for making a great product. 1. Can the horizontal bar be cut to 16 inches to match stud spacings? 2. The previous question indicated that the bar needed to be attached to a stud only on one side. How would you attach the other side to drywall only ... and would that meet ADA specs? Does this grab bar come in a satin or brushed nickel? Can the 18&quot; grab bar be installed at an angle (as opposed to vertically or horizontally)? Is it possible for me to cut this down in length to work with a 16&quot; stud spacing layout? Example: Can we remove a set screw from the 90 degree returns, cut the bar down to length and then screw it back together?